Khaas Seekh recipe by Rakhshi at PakiRecipes.com. 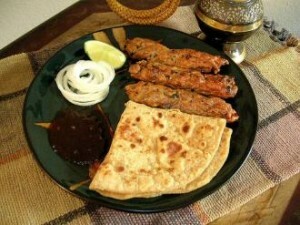 A delicious combo of Paneer and seasoned minced meat. 1.Soak the satay sticks in water for a while. 2.Take grated paneer, processed cheese, half the cardamom powder, half the garam masala powder, mint leaves and mix mashing with your hands. Take a portion of this mixture and place on a satay stick and press it around the stick till it is a thin layer. Press the ends firmly. 3.In another bowl mix grated khoya, chicken kheema and mix. Break an egg and add. Add salt , remaining cardamom powder, white pepper powder and remaining garam masala powder and mix well. 4.Take a portion of this mixture and spread it over the paneer mixture. Similarly prepare the other seekhs. You can keep the seekhs in the refrigerator for some time before frying. 5.Heat sufficient oil in a pan and place the seekhs on it and shallow fry. Turn the sticks when one side is done so that the other side gets cooked similarly. 6.Serve hot sprinkled with chaat masala.